The HTC One Max will be truly massive, according to the the latest photo leak. The alleged upcoming phablet popped up on NoWhereElse.fr (the same site that yesterday brought us a supposed LG G2 manual). It appeared courtesy of the same person who leaked previous HTC One Max photos. Today's leak is a big improvement, however, as it purports to shows just how big the One Max really is. The phone that it's under is reportedly the Motorola Moto XT882, a device that's 4.81 x 2.46 x 0.52 inches with a 4-inch display. By comparison, the HTC One Max looks like it could eat the XT882 for breakfast. 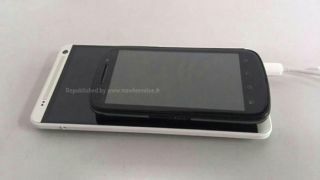 It looks like the HTC One Max may be on the docket for IFA 2013 as rumors of a September release are compounded by HTC's own teases. Just yesterday the Taiwanese company release a snippet of video involving a briefcase, a helicopter, and a figure who may or may not be Iron Man. An ominous "big things ahead" tag line accompanied the tease. Currently, it's thought that HTC will send the HTC One Max into the ring to duke it out directly with Samsung's Galaxy Note 3, and it's yet to be seen which one will turn out more massive. Currently the HTC One Max is believed to have a 5.9-inch 1080p display and a 2.3GHz quad-core Snapdragon 800 processor, which would make it both bigger and packing more oomph than the HTC One and its 1.7GHZ quad-core Snapdragon 600 chip. It could even arrive rocking Android 4.3. Turn to TechRadar for all the latest news and rumors on the HTC One Max and its likely main rival, the Samsung Galaxy Note 3.